Cults are so hot right now. Film, literature, games, everybody is making cult media right now. Alexis Kennedy and Lottie Bevan are the minds behind the recently launched Cultist Simulator, possibly the most explicitly cult-y work I’ve seen in recent times. I got the chance to infiltrate their ranks and ask them about building their Lovecraftian card game. Read on for the full interview. Why don’t we start out with the basics: who are you and what is Cultist Simulator? Weather Factory is a new indie microstudio comprising dev couple Alexis Kennedy and Lottie Bevan. Our histories are both entwined with Failbetter Games (Alexis founded the studio and was the creative director of Fallen London and Sunless Sea, amongst other things; Lottie was Failbetter's producer, working across Fallen London, Sunless Sea, Zubmariner, and until she left, Sunless Skies). Weather Factory's explicitly set up to make weird, experimental narrative games. Cultist Simulator is just one such weird, experimental narrative game! It's a Lovecraftian horror card game with RPG, roguelike and strategy elements, where you play as the antagonist in a 1920s themed occult setting of hidden gods and secret histories. It released around a week ago on Windows, Mac and Linux, and seems to have gone down okay! Cultist Simulator is a single player digital card game, what made you want to tell a Lovecraftian horror story through these mechanics? The Lovecraftian element comes into play when you think about the metanarrative. The player looks down facelessly onto a dimly lit table in a non-descript space of darkness, shuffling around resources to fulfill their ambitions. Everything being represented by cards, humans become interchangeable with things like pocket change, the glimmering of an idea, or a scrap of notepaper you found in your desk. It's a lonely, cruel way of controlling the world, once you start to think about it, and very Lovecraft. You’ve both had a career full of making games filled with dread. 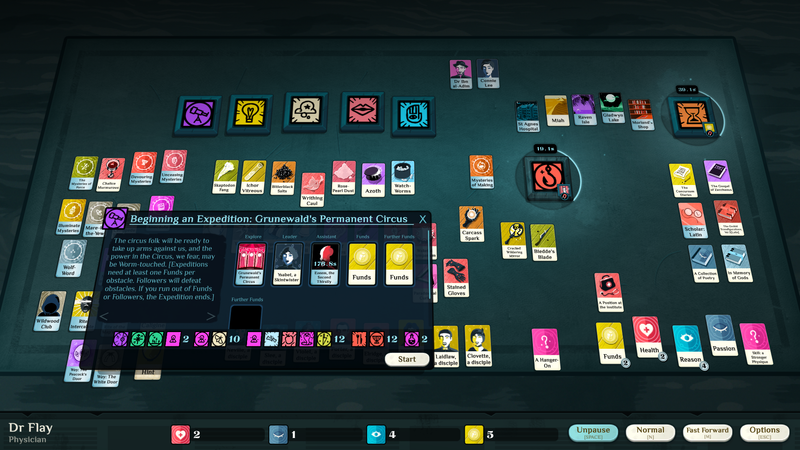 How has Cultist Simulator benefited from your experience? The game plays with the balance between the known mundane world - people's jobs, which pay the bills but don't fulfill their souls - with this magnetic, mysterious, dangerous occultism you slowly uncover as you play. I'd say most game developers have some first-hand experience of being pulled in both directions, and the possibility of losing yourself to the more esoteric realm! Sunless Sea and Fallen London were also both huge influences on the game. Anyone who's played either of them will recognize similar motifs and mechanics in Cultist Simulator, though they should feel like an evolution of their previous form. Sunless Sea in particular dealt with a dread mechanic - called Terror - which you had to manage, and was an unavoidable side-effect of exploring a dark yet delectable world. Dread is more specifically human-centric - there's an easy comparison to how it works in-game with depression, which is something Alexis has had to battle in the past. You’ve announced that early customers of Cultist Simulator get all upcoming DLC for free. Can you tell us anything about this upcoming DLC? We can! 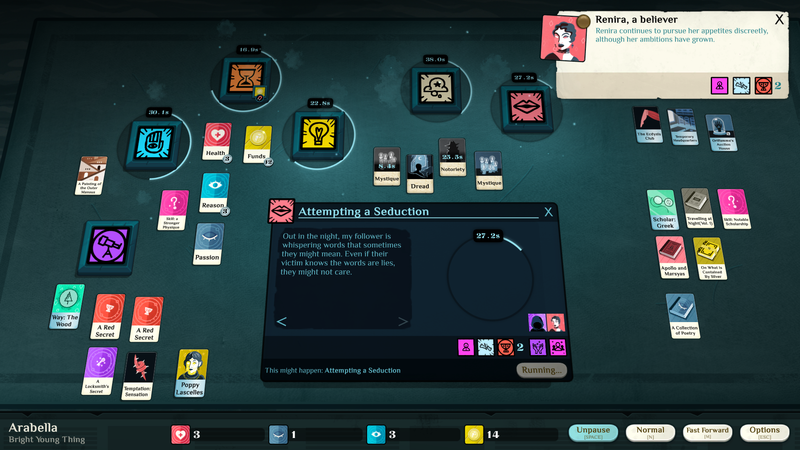 Cultist Simulator's launch has gone better than we'd ever dreamed it would, so we're more happy to talk about this now than we were before release. We're committed to releasing a number of role-based DLC packages, which will add new legacies and new playable characters to the game. We think the first two bits of DLC will introduce new Priest and Dancer roles, while we're planning to release a number of free updates to incorporate new victory conditions and legacies. Based on feedback, we're also likely to release some UI-centric quality of life updates, but we're not certain on the details yet. Cultist Simulator had a fairly open development cycle. Why did you choose to be so available to the community, and what did you learn from this? We're big fans of open production, where you bring your community into your development cycles as early as possible. It's absolutely invaluable: you get a bunch of beta testing, a group of really experienced players who understand the game better than you do, and a bunch of champions who have an emotional attachment to your game and your team because you've basically made friends with them over the x months you've worked on the game. Don't underestimate the psychological support a community gives you, too: the internet is not a kind place for human brains! Our community absolutely made Cultist Simulator the success it is today, and we love them. We've practiced open production since Fallen London really, though Sunless Sea's production was where we finalized the formula we still mostly use today. It keeps you honest, as a dev, and makes sure you don't end up squirreling yourself away into something that turns out not to be worth the effort. Honestly, I can't think of a reason not to engage your community during development, at least for an indie developer! Finally, do you have anything you want to say directly to our readers? IN GI RUM IMUS NOC TE ET CON SUMI MUR IGNI. Hope that helps. This interview has been edited for length, clarity, and to prevent the reemergence of the old ones. This was quite a lovely interview, I'm glad to see such interesting developers thrive on the indie scene!